The PHB23 is has a non-volatile memory (E2PROM), that stores your set-up values. Even under a loss of power condition your records are maintained. The menus are self-explanatory for easy operation and programmed from a simple 3 key face. 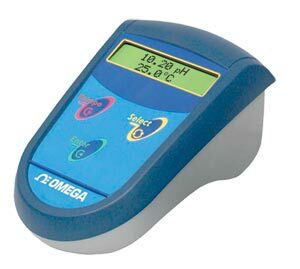 The PHB23 also has advanced features like automatic electrode check and battery status displays. The displayed readings can be continuous, held or logged to memory. A user programmable audible alarm is included for minimum and maximum alerts. For ISE, the following curves are already built in: Fluoride, Iodine, Nitrate, Potassium, Silver, Sodium, Sulfide, H+, Ammonia, Ammonium, Bromide, Cadmium, Calcium, Lead, Cyanide, Chloride, Copper and four other ions can be user programmed. 참고: Comes complete with glass electrode and electrode holder, temperature probe, power cord, calibration buffers (4 and 7), and operator’s manual (CD).